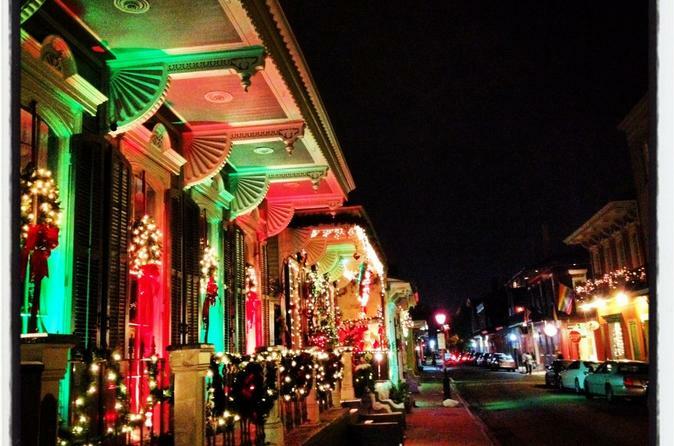 See New Orleans during the holidays and welcome Christmas with a guided stroll through the French Quarter on this festive walking tour. Enjoy the extravagant decorations throughout the French Quarter, with insightful commentary given by the tour guide. See places of interest like the St. Louis Cathedral and other historic and cultural landmarks. Visit cathedrals, restaurants, and shops, and hear stories of voodoo, ghosts, and vampires. Welcome to the home of the New Orleans Drunken Tour.... Where learning is intoxicating. Meet your guide and group on the sidewalk in front of the American Sports Saloon at 1200 Decatur Street in New Orleans a little before your departure time. This tour offers multiple departure times. With your group in tow, visit the city's decorated homes, churches, and museums while hearing the history and importance behind each location. Add a little extra spice to the occasion with a cocktail or two along the way (own expense) while exploring one of the oldest, most cultured, and historic neighborhoods in the country, complete with stories of New Orleans history, legends, voodoo, and vampires. Guests will be allowed to stop in at any of the bars that the tour group passes along the tour route. Follow the guide through the magical streets of the the French Quarter, and pass historic and cultural landmarks lit up for the holiday season. Visit the exact location where the Louisiana Purchase was signed in 1803, see the famous St. Louis Cathedral, and discover many more places that played a vital role in the city's history. Of course, no New Orleans tour would be complete without stories of voodoo, ghosts, and vampires. As an added form of entertainment, a real EMF Meter, a Ghost/Paranormal Detector will be used during this tour. Along the way, check out one of the most haunted houses in the city, and learn about the voodoo queen, Marie Laveau, while visiting property given to her as payment for her magic. Please note that we cannot control when and where locals decorate. Rest assured that we will provide the best of the best! There are some seasons that the decorations are not as elaborate as others. This tour is the New Orleans Drunk History Tour, CHRISTMAS version.